The past few weeks I've had a song on my heart. A song we sang in church when I was a child. Soon. So soon my friends. We are going to see our King! Our Father, the One who died for our sin. We are going to see Him. The time is at hand. We don't know when, but He is coming! We don't know the time when Daddy God is going to tell Jesus, "the time is now, My Son, go get My children." But it will happen and we must be ready. Are you ready friend? Maybe you have never taken the step to ask Jesus into your heart. Or maybe you have, but you haven't been living for Him lately. Friend, it's time. You have nothing to lose, but an eternity with Jesus to gain! Are you ready to say that prayer? To ask Jesus to live in you? Say this prayer aloud with me please. Jesus, I come to You today to ask You to live in my heart. That's it! You're now a Christian. Whether that is the first time you've said a prayer like that or you've said it before, you are now a child of God and you belong to Him. 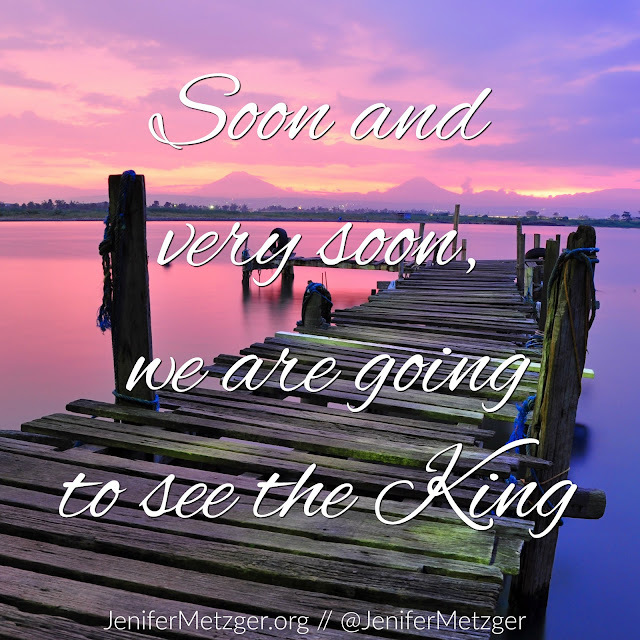 So my friend, soon and very soon, you will see the King!